As a young man making his first journey into the wilderness, Kenton saw the Ohio country as a place to leave behind the failures of the past and make a fresh start in life. Mistakenly fearing he was wanted for murder in Virginia, Kenton assumed a new name on the frontier and began a career as a hunter and fur trader. His exploits as a frontiersman became legendary. He scouted for armies in the wilderness, repeatedly escaped torture and execution at the hands of Indian tribes, and survived numerous battles. Ironically, Kenton helped change the frontier from an untamed land of opportunity in which he could roam freely into a settled civilization--such as the one from which he had escaped. He was, in the classic sense, a trailblazer leading others who would further tame and develop the land. 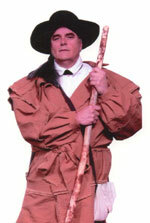 Gene Worthington brings Simon Kenton to life and vividly depicts the American frontier.